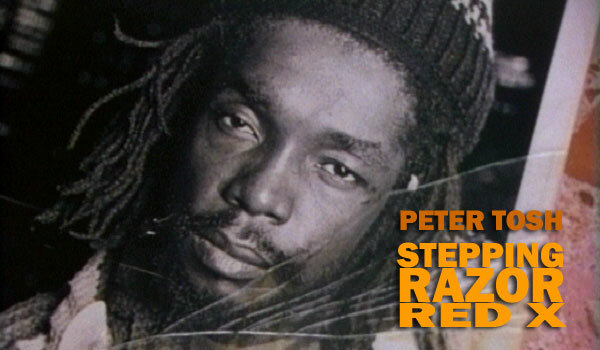 After a stylish ten minute exposition which addresses Tosh's musical and social legacy, Stepping Razor starts to tell the story of Tosh's life. He was born poor and without a proper education, forsaken by his mother and raised by an aunt in another small town in Jamaica. Even in his early years, an inner creativity would ensure that Tosh would go from humble beginnings to bigger and better things. "All we had was nothing. Sheep without shepherds, students without teachers. Because of some divine spirit we were born with, we learned to fight nothing with nothing�and get something." The monotone sound of Tosh's voice, taken from the Red X tapes, narrates chilling re-creations of some of his childhood memories, including an encounter with barbed wire that makes you wince. The film then delves into concepts of racism and Christianity and Tosh's attempts to make sense of them. He sought to find reality in the notion of God that he was being taught -- a theme that would later form the basis of some of Tosh's best songs. As a teenager, he was horrified when he was forced to move to the notorious Trenchtown neghborhood of Kingston -- a ramshackle housing project for low income families built around a long sewage trench. It was his first exposure to racism and oppression, the "shitstem" which would later enrage him so much. "I saw poor people with the dignity of a millionaire," he opined. Documentaries always have the unique problem of how to reconcile existing footage into the new narrative without slowing the pace of the film; for the most part, Stepping Razor succeeds in this respect. The film does stumble at times when it mixes scenes of ghetto life with snippets of Tosh's music playing on the soundtrack; in some instances, the visuals nicely complement his words, while other times they seem repetitive and clich�d. Another drawback -- paradoxically, for reggae fans -- is the overuse of footage of Tosh performing live. At times, it's dynamite, with Tosh on stage, slicing the air with a machete and giving his all under the glare of blood red flood lights. Other times, the footage isn't so interesting, and one gets the feeling that it's almost padding the film out. An obvious example shows Tosh and his band performing "Don't Look Back" on Saturday Night Live. Midway through the song, Tosh is joined by none other than Mick Jagger. After the initial novelty of Jagger's appearance wears off, the segment continues on for far too long, like a guest overstaying their welcome. Stepping Razor is at its best when Campbell stylishly re-creates stories culled from the Red X tapes, with hand-held cameras and startling, low angle close-ups of actors. With this technique, Stepping Razor's tour de force is near the end of the film when Campbell feverishly re-creates Tosh's murder, interspersed with stark black & white newspaper photographs of the actual crime scene.